The Fuji Electric Portaflow C is a next-generation, portable ultrasonic flow meter utilizing transit time technology for the non-invasive measurement of flow rates in pipes. This compact and light weight instrument offers high performance and easy operation. Utilizing the latest electronics and digital signal processing technologies, the Fuji Electric Portaflow C offers high accuracy, quick response time, and outstanding anti-bubble characteristics. In addition to standard flow measurements, the Portaflow-C is capable of heat quantity measurement allowing simple management for heating and cooling applications. The Fuji Electric Portaflow-C can be used with various type of detectors applicable for small to large diameter pipe (13 to 6000 mm / 0.5 to 236") and low to high temperature (-40 to +200 deg C). This flow meter is designed for 12 hours of continuous operation with its own built-in battery which is re-chargeable in 3 hours with the supplied power adapter. An SD memory card allows flow, velocity and total data to be stored for later recall. A universal USB port permits communication with a PC to facilitate configuring the Portaflow-C as well as saving and reading data files. A 4.7 inch color graphic display creates an easy-to-use operator interface. 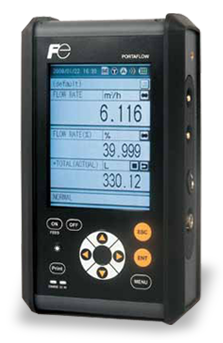 Some of the most common applications of the Fuji Portaflow-C ultrasonic flow meter include: backup for an already installed flow meter system, water supply and sewage treatment, flow measurement systems, boiler water / feedwater supplies, cooling water, cooling oil, and de-ionized water for semi-conductor manufacturing, among others.